(TibetanReview.net, Jul13, 2014) –A large group of Chinese police took away on Jul 9 a young Tibetan Buddhist monk minutes after he began a lone protest march in Serta county-town in Karze (Ganzi) Prefecture of Sichuan Province, demanding freedom for Tibetans and their exiled spiritual leader, the Dalai Lama’s return, reported Radio Free Asia (Washington) Jul 11. The report said the monk, Sherkyab, aged 20, also scattered leaflets as he shouted slogans and marched on. The large group of Chinese police arrived in about five minutes and took him away. There is no information on his whereabouts or conditions. 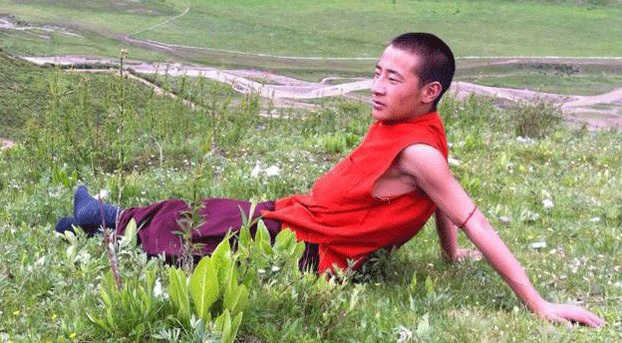 The report said Sherkyab was formerly a monk of Nubzer Monastery, located about 20 miles from Serta town, and more recently a student at the famed Serta Buddhist Institute.